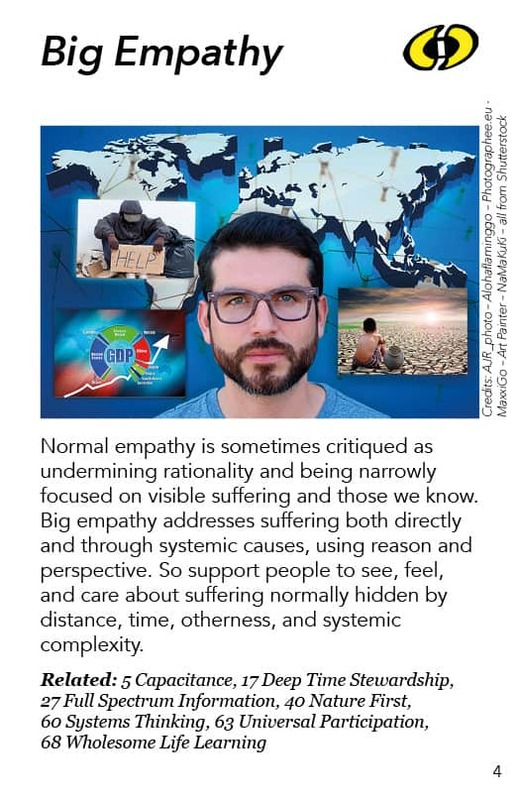 Normal empathy is sometimes critiqued as undermining rationality and being narrowly focused on visible suffering and those we know. Big empathy addresses suffering both directly and through systemic causes, using reason and perspective. So support people to see, feel, and care about suffering normally hidden by distance, time, otherness, and systemic complexity. Our normal empathic response – unless we have some serious disability in that realm – is designed to feel for the immediate suffering of others around us. The more the person or entity (like a pet) is like us, the more they are part of our group or family, the more they are recognized as us instead of them, the more we feel empathy. If we see them as them, we don’t necessarily feel empathy at all. We can feel much more empathy towards a dog that is like our dog than we can feel for a person caught in a war 10,000 miles away, or for a bug that is being killed by some poison that we have put on our crops, for example. As empathy can be powerfully and narrowly focused on visible suffering of those that are like us, loved by us, or known because they are part of “us”, our reason may say, “Don’t let these feelings get in the way of what you’re doing.” But often we can’t help it: somebody is suffering and we need to reach out – in our hearts, if not always in action. The fact that this feeling is both narrowly focused and powerful makes it very suspect for people who are trying to find rational solutions to our collective problems. Empathy can easily be viewed a distraction. Big empathy is trying to speak to that by saying, “We can have an empathic response that starts at immediate feelings for visible suffering, but functions within an expanded sense of who and what is included in ‘us’, who and what we feel empathy for.” Einstein spoke of “widening our circle of compassion to embrace all living creatures and the whole of nature.” So big empathy is a big form of empathy because we do recognize that the automatic empathic responses we have to the lives we are most connected with may get in the way of addressing more distant kinds of suffering. So, living in big empathy, we actively work to balance our responses to the more and less immediate and the more and less obvious forms of suffering, to find ways to be fully human at all those levels. This is not easy. We are not necessarily naturally built to expand in this way, although I’m not sure how much of that incapacity is cultural and how much is biological. In this, I am speaking largely from what I experience in Western “developed societies”. In contrast, you hear Native Americans speaking about “all my relations” – meaning all life – and even stretching to include the forces of nature. They are living in a familial relationship to all of life, which has implications for how they manifest their empathy. It’s like when you kill the deer for food, it’s not just, “here’s a piece of meat.” It’s like this is a being; there needs to be some respect for it. This is not something to abuse by cutting it up and wrapping it in plastic and putting it in the meat market, or sending it for consumption halfway around the world. You’re dealing with a life there, and it’s deserving some respect even though you know that you need to eat as part of your own lifecycle, and that everything else is eating something, too. So as the realms we are feeling into and dealing with get more complex, we need more empathic abilities in order to embrace bigger energies and concerns. One of the most interesting modern developments is our understanding of systems. We have built complex systems, economic systems, technological systems, communication systems, and more. Each of us and all of us create global impacts, often with little or no awareness of how much impact and what kind of impact we are participating in and having on the world. That impact is seldom direct. Usually, it is diffused through systems that separate us and our experience from the impacts we are having. When we are driving our cars, we are transforming the weather. We are not aware of doing that but we are participating on a larger systemic level in doing that. If the systems were designed differently, we would go about meeting our transportation needs in ways that would not be doing that. So part of big empathy is trying to become aware of those larger systemic participatory dynamics so that we can use our reason and bigger perspective as well as our caring to redesign those large systems that make it so hard to live a life that doesn’t generate suffering elsewhere (as well as harm us and our children, often invisibly). So big empathy stretches our feeling and responsiveness out into the systems we’re part of. It calls on us to find out what roles we are playing in the big picture. Which children made the chocolate we are eating? Which species are being impacted by buying this particular set of clothes we are buying? How are we participating? (We run across this issue in other wise democracy patterns, too, such as Universal Participation.) Can we stretch ourselves to care in rational ways and take caring action based on our caring reason? After all, our reason is often driven by our care. Care is the wind in our sails, and reason is the rudder that helps us steer in directions that actually makes sense in addressing the kinds of suffering or damage that we are seeing. If the suffering is far away, we may not see it but sometimes our news media brings it to us. But which suffering does our news media choose to expose us to? We need to look at diverse information sources to gain an expanded view of what we might respond to. And time can be another form of distance blocking our empathy. Big empathy senses into how we are impacting the seventh generation after us – people who have not yet been born or even been conceived. How are we relating to such a future and even to the past? Do we have compassion for people who were enslaved by legalized slavery? Do we understand what was going on in the distant past that we may now need to feel for in order to respond wisely to energies coming from that past era into our world today? To what extent are we empathizing and using our reason to address that dimension of reality, as well. And otherness is another barrier for our empathy. Our automatic empathic responsiveness asks: Is it us? Is it them? Is it alive? Is it material? Are these other life forms actually feeling suffering? Big empathy tends to assume sentience and relationship unless proven otherwise. There’s more and more research showing the vivid emotional life – the active engaged responsiveness – of more and more different lifeforms which we thought of as insensate, as not really able to experience things like pain and pleasure. Even if they don’t have complex nervous systems, we’re finding there are varieties of responsiveness and intelligence that are different from ours but which very definitely qualify. Many of us assume that we can damage and manipulate those entities as if they were totally material and not responsive living systems. Those assumptions are being increasingly questioned as science expands its understanding of the responsiveness of life. Our ability to feel compassion, to exercise effective responsibility, to exercise holistic forms of reason, are all dependent on gaining these understandings of these invisible connections, and being able to see through the complexity from our place of cause to the more removed places of effect, or from some distant place of cause to how that cause affects us. The more we can understand that, the more we can live responsibly and compassionately in the world. Nonviolent Communication is a practice of training ourselves to delve into our needs and the needs of others, and to explore how we can meet those needs together. There are some people who are stretching Nonviolent Communication beyond the interpersonal realms into group realms, relationships, natural systems and whole communities. How does the remarkably honed sensibility of Nonviolent Communication stretch to become big empathy? Systems thinking and systems change work are absolutely necessary to practice big empathy due to the manifestation of our small empathy. If we use only our small empathy, we can reduce the suffering of those close to us. But by doing that we may at the same time create absolute havoc on others, particularly if we are just trying to be comfortable. Our efforts to be comfortable often endanger other species, endanger the future, endanger the planet and far-away populations. We need to be able to understand what’s going on in systems and actively work to change those systems so our activities create more benign impacts. We would be wise to adapt the concept of the Seventh Generation from the American indigenous cultures who are saying, “Any decision we make should be done with the Seventh Generation in mind.” To a certain extent we can do this, but to a certain extent we can’t. Life is sufficiently complex that we can’t always clearly see the future impacts of our decisions. For example, the people who invented the automobile or the original computer had no idea the impacts those inventions would have. And that’s one of the jobs of science fiction and future studies. One of the main purposes of high-quality fiction is to expand our empathy to embrace the Other, and to expand our understanding of our technologies and our societies so that we can choose to expand our empathy in those directions. Both fiction and science can help us experience what is it like to be the Other – the strange person, the animal and plant, the future generation – so that we can empathize with them and treat them in more life-serving ways. And we can keep our collective eyes open for signs of disturbance that tell us we are drifting in the wrong direction. The sense of extending our empathy into the seventh generation has become the basis for an emerging movement called “generational justice”. To what extent are existing generations serving themselves by colonizing the future, by stealing resources and possibilities from unborn generations? Notice how our elders are using resources needed by today’s youth. Notice how practically everybody on the planet is now using and degrading resources needed by the future. Taking all such questions and issues seriously is a manifestation of big empathy. Gifting Economics explores what is it like to have an economy that is built primarily on gifting and generosity. In such an economy, your social status comes from your reputation for being generous, and the more generous you are, the more people want to help you. It is a very different form of security – one that actually has big empathy embedded in the economic structures. In a gift economy we find diverse rituals of giving. We find negative interest rates which cause you to want to get rid of your money as fast as you can because it is getting less valuable. Charles Eisenstein’s book Sacred Economics brilliantly describes the nature of the gifting economy if it was put to scale. If we actually ran our national and community economies that way, what would it look like? 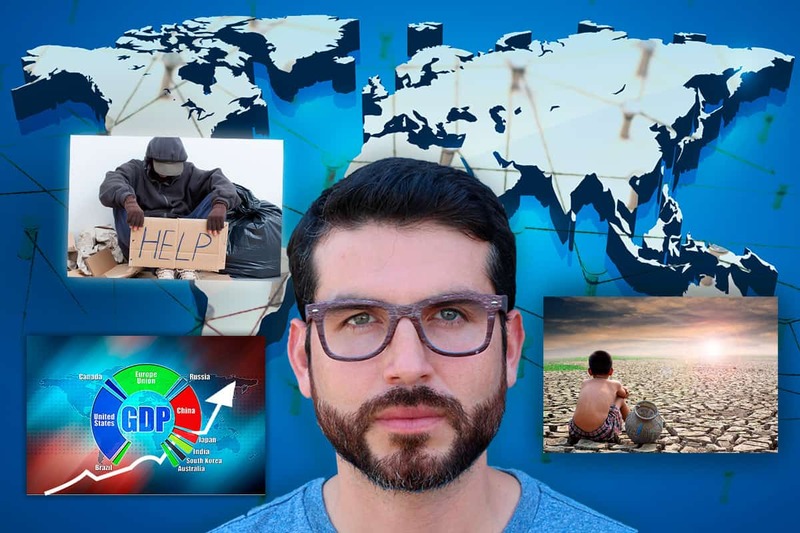 That is a form of institutionalizing big empathy – which we also see in quality-of-life indicators and full-cost accounting (which embeds the costs of social and environmental damage into the prices of products that cause that damage). These examples of taking a big sensibility about preventing and addressing suffering and embedding it into systemic structures. People who are not necessarily feeling empathic towards other people distant in space or time end up still behaving in ways that express empathy by preventing, reducing and minimizing damage on those other lives, simply by being part of those institutionalized systems. So another part of big empathy is being aware that we can create systems that have the energy of empathy embedded in them, encased in them. Everybody who happens to be in those systems ends up willingly (if often unconsciously) behaving in empathic ways even if their emotional response would not be what you normally think of as empathic. Total corporate responsibility is another interesting initiative. It had a burst of attention several years ago and seems to have sort of faded recently. But it embodies that powerful idea. It goes beyond “triple bottom line” – i.e., making one’s corporate operations ecological, socially responsible and profitable. It says, “We need to change the systems so it is both easier for us to be socially and environmentally responsible, and it’s easier for everybody else to be, as well. Because very often there are more financial costs involved in being socially and environmentally responsible, which biases the whole system towards being socially and environmentally irresponsible. For example, when we externalize environmental and social costs, our accounting does not cover the full costs. Prices then validate products that pollute and damage human and natural communities. So if we change the rules of the game so that everybody needs to be socially responsible for their own self-interested reasons, that levels the playing field and allows every company to be socially responsible without losing market share from trying. It’s like having a car company lobbying policymakers to require a higher total fleet fuel economy for every car company. If everyone has to do that, then individual companies who build efficient cars will not be penalized in the marketplace for doing that just because other companies have lower standards that increase their profit margins. There is a way in which regulation can raise the collective standard so that everybody can afford to function at this higher standard. Restorative Justice – which is one of the other patterns – embodies big empathy because the empathy is not just for the victim. The empathy stretches out to the community, to the person who did the crime, and more effectively to the victim. The fact is that, in most of our current “justice” systems, the victim does not actually get made whole by having the perpetrator put in prison. But in restorative justice the victim is made whole by being seen by the offender for the damage that the offender did, by the victim and offender exploring ways to be in positive relationship, by the offender trying to make up for what they did, and by the larger community taking appropriate responsibility for what happened and what will happen in the future. Those are all forms of making whole. This is trying to expand our sense of what would reduce the overall suffering in this system of victim, perpetrator and community. We are trying to raise it all up. Narrative Therapy that originated in Australia has been used with and by aboriginal people who, like indigenous people in so many countries around the world, have been oppressed and marginalized. Therapists working with them help these people see how incredibly competent and even heroic they are as they struggle with the inordinate challenges of their oppressive environment. The other people in society do not have to deal with nearly the level of challenge that aboriginal people did. The therapy would move them from feeling they were no good to noticing that they were dealing with amazing challenges – and look at how well they’re doing under those circumstances! Then they’d say, “Let’s start using some of those special capabilities you’ve developed to transform the systems that are oppressing you.” It’s taking therapy and instead of saying “I’m gonna help this individual” it says, “I am going to help this individual to recognize their gifts and power and to use those gifts and power to transform the oppressive systems.” So that’s another expansion of empathy to embrace a much larger world than simply direct person-to-person compassion or help. And the last example I am going to offer here is multiple viewpoint drama which is also covered in the Multiperspectivity pattern in this set. Multiple viewpoint drama was originated by Anna Deavere Smith. She did two one-woman shows about actual riots were she takes on the perspectives of different people who were involved in different parts of the riots – the cop, the person hiding in their house, the person throwing things and burning stuff in the streets, and so on. Each one has a perspective that makes total sense for them. She gives dramatic voice and context to what real people said in interviews she did with them. She helps viewers expand their sense of the odd legitimacy of all these perspectives and all these different lives – given the lives that they have led – and the perspectives that have evolved based on their experience. If you’re going to be involved in a community that is prone to riots or is about to have a riot or is affected by riots, by seeing the multiple viewpoints that go into generating what happens, you are able to develop an empathic relationship to each of those viewpoints and so have a wiser view of what goes on in these intense social events. So big empathy challenges us to actually expand our empathic sensibilities so we actually do take into account what needs to be taken into account for long-term broad benefit – which is our working definition of wisdom in the public domain.